The opening ceremony of the London Olympics is just hours away after seven years of preparations. The three-hour spectacle in the Olympic Stadium will be viewed by a global TV audience of around a billion people. The day of celebration began at 08:12 BST with a mass bell ringing. Big Ben rang for three minutes for the first time since King George VI's funeral. Lord's cricket ground has turned away spectators trying to get in to watch archery amid confusion over ticketing. The London 2012 website advertised the event's preliminary rounds as "unticketed", which some members of the public interpreted as open to the public. But Olympic organiser Locog said it had not advertised or sold tickets for the ranking event and had always made it clear preliminary rounds were not open to spectators. South Korea later claimed the first two world records of London 2012 in the men's team and individual archery. 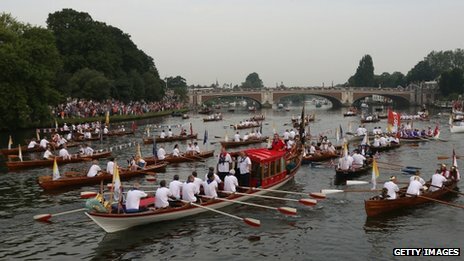 Meanwhile, the Olympic flame has arrived at City Hall on the Queen's rowbarge Gloriana after first weaving through the maze at Hampton Court Palace and being carried along the Thames on the final day of the torch relay. The flames's 70-day nationwide journey ends with the lighting of the cauldron during this evening's opening ceremony but the identity of the person who will take on the honour remains a mystery.